The Direct Input box takes a high impedance, unbalanced signal and converts it to a low impedance, balanced signal. This allows the signal to be sent over long cable runs with significantly less signal loss (especially in high frequencies) due to the lowering of the impedance, and greater rejection of interference due to the benefit of common mode rejection in a balanced signal. Furthermore, the lower impedance (around 600 ohms is normal) allows an insignificant load to the input of a mixing console or preamp which is also designed to accept input from low impedance microphones. 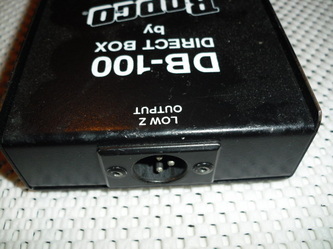 The DB100 is a passive direct box that allows you to take a Hi-Z instrument and turn it in to a Lo-Z line out. A special jack for ground lift eliminates 60 cycle hum. With its heavy duty steel box and high performance transformer, its no wonder the DB100 is one of the best selling direct boxes on the market today. 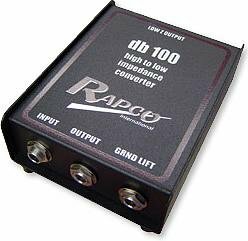 The DB100 is made with Rapco's DBT Transformer which is wired in-house to assure the highest level of quality.